Wow! I had no idea that the amazing “Scotties Tournament of Hearts” was happening this year so close to us up in Montreal, Quebec! From Saturday, February 1, 2014, through Sunday, February 9, you’ll have the opportunity to watch some of the best women’s curling teams out there competing in this annual Canadian curling championship. 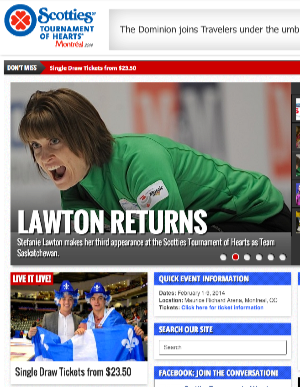 Given the Canadian love of curling, the competition is fierce and so the teams that make it into the “Scotties” play at an unbelievable level of the sport. They typically make shots that I could only dream of someday making! Alas, I don’t think that I’ll be able to make it up to Montreal this year, but if you can it would be an amazing experience to see these curling teams in action! No news on their site or their Facebook page about a live video stream but perhaps we’ll see more about that closer to the time of the event. This entry was posted in Events on January 30, 2014 by Dan York.